Perfectly Created Chaos! : One card for a Busy Day! Sorry it's taken me such a long time to post today. I've had a super busy day today that started with grocery shopping early this morning. Then T had a friend come over after school so I had 3 very energetic little boys running through my house for about 2 hours...not exactly conducive to stamping. I also had to get the party favors ready for R's birthday party tomorrow. Her birthday's not until August and yes, we're having a party tomorrow for her; but that's a whole other story. I actually had a chance to do some stamping really really early this morning. This card was actually finished before 6:00 this morning. This is another Mother's Day card that I will be giving to my sister in law Jennifer. She is a mother of four and is constantly on the go. She's so pleasant, always keeps her humor, is carefree and is passionate about being a mom. I truly adore her and feel blessed that she is a part of my world. This card was super easy to put together and is very self explanatory. I've got tons more things to do this afternoon before the DH and I leave for a social function this evening. I've seen the WSC sketch and do plan to work on that tomorrow sometime over the weekend and will share it with you on Monday. As you can see also, I've changed the blog background for the new month. I decided to show my pride as a Marine Corps Spouse and to honor the hero in our family by going with a USMC themed background. It seemed like a fitting theme also since it's National Military Appreciation Month. I hope you like it! I love the petals on your flower, and the sentiment is great, too! great card, love the design on the flower. How fun to have different colors for each petal. 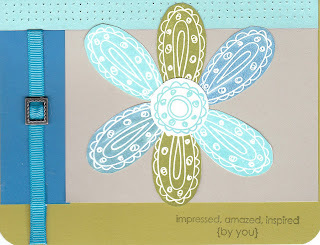 fab job on the card, cool blog background! Love the look of this card! Awesome!